The cold, fresh air blew past my warm, bundled-up face. The mountain loomed confidently, effortlessly disentangling the fluffy clouds in the distance. "That is the mountain we are going to climb," John, the leader of our adventure tour explained, pointing at a humungous mountain. "Yes, it's as difficult as it looks, and no, there is no sky bar at the top." John led through the doorway, so we followed suit. Once the seven of us had mustered and settled in the briefing room, he continued. "So, we'll start the hike to the foot of the mountain at 9:00 A.M tomorrow. At about 1:00 PM, we'll stop at the foot of the mountain for lunch. 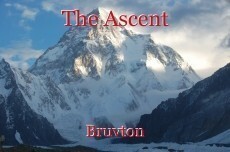 Then, we'll begin our ascent, and reach the first base camp at 500 meters above our current level by 5:00 P.M. There, we'll set up camp and stay for the night." I looked over to Jimmy, who was fiddling around with his fingers, not really paying attention. "Pssst," I whispered, catching his attention. "Dude, are you ready to climb the mountain?" He looked up, disregarding John and his perpetuous blabbering. "Man, I've been ready for this since I could walk. All of this planning is pointless. And boring. I mean, what do they expect to go wrong?" John looked at us to check if we were paying attention, so we acted engaged. "We have satellite images of the entire mountain, so we know where to and where not to go. Now I'll show you examples of the most dangerous parts of the mountain, and where not to go at all costs. Right here, there is a..."
Still maintaining the illusion of our engagement, Jimmy poked me on the shoulder to grab my attention. He seemed more excited this time. He whispered, "You know that one group of scary looking people we saw at the airport? Well, I overheard that they were climbing this exact same mountain at the exact same time as us. They seem like a bit of a big deal, and stuff. Like, government and CIA kind of stuff. I don't think they want us to know they're here, and I don't know what they're doing here." I considered that as I nodded incoherently to John as he explained something ponderous. "At no cost should we leave the designated trail," John droned on. "I know we have satellite images, but they cannot be updated. Remember, even if it looks safe, you could still die. So, we have to make sure..." I yawned as I attempted to get in a comfortable position. After packing all of our residual equipment, we were finally ready to go. Our heavy backpacks were certainly going to hold us back a bit, but we had planned for that. The mountain we were about to climb looked overwhelmingly monumental. Well, it was. Surrounding us were plenty of other beautiful mountains, but ours was the most ambitious. The air was fresh and the scenery was stunning. Where we were was where Jimmy and I had longed to be. Four and a half hours had passed, and the mountain looked even more colossal. There was a log cabin evident in the distance, right on the foot of the mountain. Each step we took felt like we were on a treadmill, and I was already tired from the walking. My shoulders ached, and I thought of all of the pain and torture of exhaustion and lack of oxygen I would experience in the near future. As long as none of us got elevation sickness, I thought. I checked my watch. It was 12:55 P.M. We had reached the log cabin five minutes early. We all herded to enter the cabin, and as we opened the door, the warm air greeted us better than any human could ever even try. We abruptly left our backpacks and boots on the floor of the entrance, and all sat down on the nearest chair or couch we could find. We crowded the only two couches with our tired, overworked bodies. We sat, chatting tiredly for about half an hour until the food came. That was when I realised how hungry I was. The walk up the mountain was way more difficult than the walk to the mountain. It was just a constant incline, and our progress still had the illusion of being limited. By the time we made it to the first campsite, hardly anyone was in the mood to set up their tents. They all did, nonetheless, and the whole camp was silent by 6:00 P.M. I woke up and checked my watch. It was 12:34 A.M. I really had to urinate. I stealthily crawled out of my sleeping bag and sneakingly grabbed a jacket. Being as discrete as I could, I opened the zipper of my tent, and the cold air rushed in. We hadn't reached snow yet, but I decided to grab my boots, anyway. Answering nature's call too close to camp felt awkward, so I took a ten-minute walk eastwards. I was peacefully doing my business as I heard a rustling sound in the bushes. I quickly looked behind me and thought I saw a shadow. I was too tired to be able to tell if it was anything, and it was also too dark. I was also apparently too tired to not make a mess. I looked around the mountain, and in the distance, my subconscious noticed a camp. And it certainly wasn't our camp. Absolutely disregarding it, I stumbled back to my tent and was quickly dead to the world. I woke up, yet again. Except this time, I was supposed to. I got completely clothed, including my jacket and so forth. I was ready for breakfast. John called a random head-count while we all sat and ate breakfast. I was there, Jimmy was there, John was there, and the three others. Good! We were all set! Once breakfast was done, we packed up all of our stuff, including, of course, our tents. One was still up. We checked to see whose it was. Upon unzipping it, a metallic, warm, and sickening smell briefly filled the air. We looked inside to find the forgotten person number seven, pathetically sprawled on the floor of his tent in a puddle of blood, with a slit throat. We helplessly looked at the body in horror. The deceased was just a random guy who decided to join just for fun and usually kept to himself. Enclosed in his hand was a note. It read, "Keegan died in a climbing accident. His body was lost in a crevasse. The climb will continue, but the truth will not. If you do not comply, your families will suffer a similar fate." Shaken up, we did what we had to do. We kept climbing. And fast. After progressing the approximate amount of a kilometre, we sat down to discuss our plans. "I vote we just climb and see how it goes. We don't need to plan. We'll just take a new path," I suggested. John didn't agree with me. "We need to stay on track no matter what. I planned ahead, and I think we should continue as planned." We looked back thoughtfully at the tent. We sure weren't going to deal with the body. Suddenly, a team of people ran up to the tent. One of them took a canister of what we assumed was gasoline, and completely drenched the tent. We watched in total shock as they lit it on fire. One of the people turned our direction. We could hardly see him, but we could see that he signalled for his friend's attention. He pointed in our general direction, and then the two of them alerted the rest of the team. They could be pointing at anything, I thought as they pulled out guns. There was a storm of gunshots as the assailants ran towards us. One of them had a rifle, was aiming carefully, and shooting with professional precision. A bullet whizzed past my head. "Okay," John reasoned, panicked. "Ignore all previous plans and RUN!" Jimmy and I beelined westward, John and one other advanced North up the mountain, and the last two went east. I gained no ground with my backpack on, so I tore it off my back and threw it carelessly to the ground. Looking behind me, I saw one of our team who ran Eastward had fallen to the ground and was writhing in pain with massive amounts of blood pooling around the hopeless case we were once acquainted with. The other stopped dead in his tracks, traumatized, to comfort his friend in his painful last moments. A small hole was strategically blasted through the side of his head, and he thumped onto the ground, motionless. The adrenaline was pumping faster than oil in the Middle East as I ran faster than any man would ever imagine. A gunshot whipped near me and sunk into the rock right at my feet. I tripped and crawled to a small cliff to hide. Jimmy slid by my side. Ten hours had passed. We had climbed cliffs, walked ledges, and ran ground. I was dizzy out of my mind, and Jimmy was pale as a ghost. We were definitely in the snow now and were freezing cold. I thought about how off-course we were and wished that I had looked at the satellite images beforehand. "Let's get back on the path," I suggested. Jimmy just mumbled incoherently. We were walking towards where we thought was the path, on a narrow ledge abruptly becoming a cliff. Jimmy did not look healthy. He was most definitely suffering a severe case of altitude sickness, I thought through my shock, dizziness, and confusion. "I can't see, man. I can't see!" Jimmy helplessly cried. "Promise me we'll make it home alive, man. We will, won't we?" I was too scared to reply. We kept walking, and I just got more and more dizzy. Jimmy was swerving and swaying uncontrollably. We hadn't noticed that the ledge we were walking on was getting steeper and steeper, when all of a sudden, there was a small patch of ice. The incline was 35 degrees, and the realization of what was going on hit me like a runaway train when I suddenly slipped and spread out my arms and legs to get a hold of anything I could. I wasn't thinking straight, but I knew I was fine, as far as not dying goes. Jimmy was a few steps behind, mumbling, panicking, and crying his eyes out. "I want to go home," he pleaded. "All I want is to see my family one more time..."
"No!" I yelled desperately as he kept pressing on. He couldn't hear me. "Stop!" I begged. He didn't. I watched in what seemed like slow-motion as his feet were swept off the ground, his ribs smashed the near edge of the cliff, and his body tumbled down. I could hear his screaming, but it was abruptly stopped with a thud. At least he got his sweet release, I thought grimly. I crawled to the other side of the ice patch and saw John in the distance, who kneeled down to the ground and flopped into a lying position. The cliff eased into a small incline 200 meters away, and I ran to John with my eyes blurry with tears. John was fine. He was tired but fine. His companion was shot heartlessly during the mad yet ineffective struggle away from sure death. Upon following the planned path, John didn't reach any cliffs. Or altitude sickness, for that matter. Out of breath, he explained a plan to me. "I planned a second course down the mountain in case of emergency," he said. "I made it a couple weeks before we planned on climbing the mountain. This way, we'll be able to descend discretely and efficiently. If we execute the plan efficiently, the ruthless murderers won't know that we escaped. I'm so glad I planned into the future for the unexpected." Taking the alternate route down the mountain, we managed to make our descent in eight hours. Once we reached civilization, I collapsed with exhaustion. I was rushed to the hospital with a threatening case of altitude sickness. I had learnt a valuable lesson in those tough three days. If I would have followed the plan, paid attention, and minded my own business, Jimmy would have still been there with me. My life was something to be valued, and from that moment on, I decided to put that value to use. That's a darned good story, Bruvton. Very different from your usual style, but wow! Thanks for the awesome comment! Yeah, I usually write differently under stress. This had good pacing and build-up, although I lost sympathy for Jim/Unnamed Protag (I'm calling them Brenda) the second him and Brenda blew off the safety lecture. I also liked that oil metaphor. The story isn't long, but it can seem overly stretched because there are an amount of run-on sentences that could be broken up. There are also a few minor grammar and punctuation issues (see iComments). Thanks! I'll make sure to fix it (eventually)! I have a bad habit of using run-on sentences, but I'm working on fixing it. Again, thank you so much for the constructive comment. Thanks for the awesome comment! I'm glad you enjoyed the story! Congratulations on your win! A magnificent achievement my friend! This was a very creative story & it leaves the reader with questions about how it will continue. That’s a very good way to write! Clever! Ummm... I'm glad you think so? Thank you for the feedback! I'm glad you enjoyed it. I edited it thoroughly, which is something I don't always do with my writing. I like to mess around with different genres every once in a while, too. OHH WOW! This is so beautifully written! Your masterpiece! Congratulations for winning Bruvton. I'm so happy for you. This is a good story, but I had a few problems with it. The dialogue at times seemed below what you hear in a badly dubbed Japanese movie. The fact they even considered continuing. They should have been talking about alerting the local law enforcement, not let's get climbing. I never did mountain climbing, but I did parachute a few times and I that one time there was a pair of jokers in the same group as me. They had done it before and bullshitted through the whole safety speech. The instructor didn't let them on the plane because of that. If John was as good of a guide as you tried to portray him he would have booted the MC and Jimmy for bullshitting when he was going over the details of the plan. Yeah. This short story was very immaturely written. It's just action for the sake of action. Since writing this story, I've been getting a lot of tips to read dialogue out loud to make sure it's realistic. But I did have fun writing it, and I guess a few people had fun reading it. Thanks for the constructive criticism! I’m pretty sure I am late, however, this is such a great story! A well-deserved victory. Congratulations! Thank you so much! I'm glad people are still reading this story!